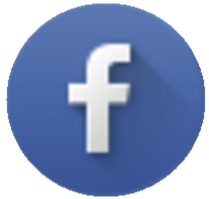 Syngas, or synthesis gas, is a fuel gas mixture consisting primarily of hydrogen, carbon monoxide, and very often some carbon dioxide. 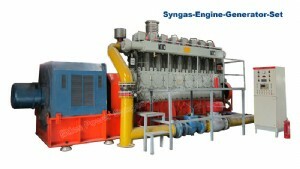 Syngas is usually a product of gasification and the main application is electricity generation. Syngas is combustible and often used as a fuel of internal combustion engines. It has less than half the energy density of natural gas. Syngas can be produced from many sources, including natural gas, coal, biomass, or virtually any hydrocarbon feedstock, by reaction with steam (steam reforming), carbon dioxide (dry reforming) or oxygen (partial oxidation). Syngas is a crucial intermediate resource for production of hydrogen, ammonia, methanol, and synthetic hydrocarbon fuels. 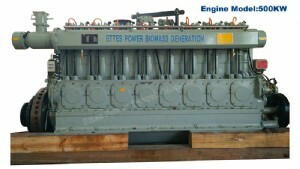 Ettes Power syngas-biomass engine generator ranging from 200kW upto 1200kW. 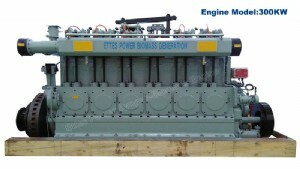 Ettes Power is one of the leading generators assemblers and suppliers in China. 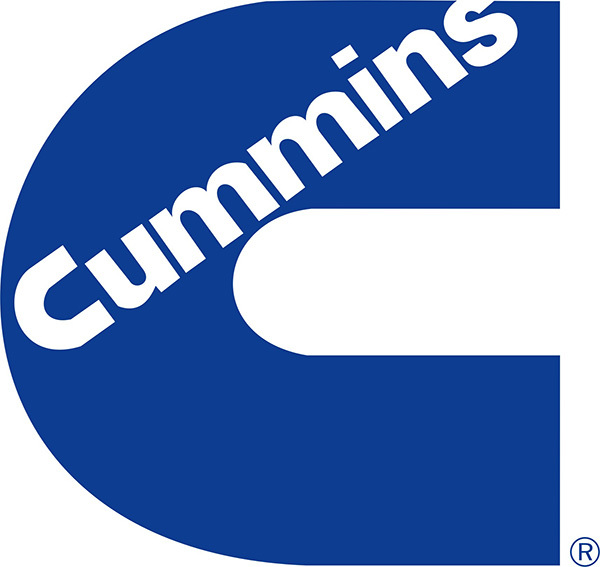 The gensets power ranges from 20kW upto 4500kW, which can be driven by world top engines of Cummins, Perkins, MAN, MWM, Deutz, CNPC 190 and Low Speed 300 series. 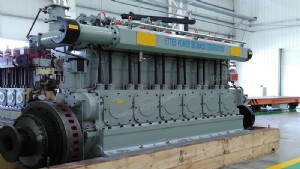 Ettes Power generators enjoy hot markets in more than 70 countries all over the world including Latin America, Africa, Middle East, East Europe and Southeast Asia etc. 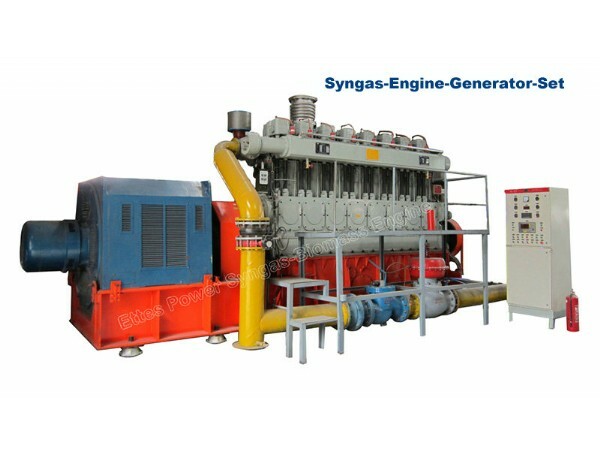 For syngas-biomass generator, Ettes adopt 300 series engines, which is specially designed for low quality gas like syngas, biomass and coking gas etc. The 300 series engines has remarkable features and advantages of low speed, big cylinder, big displacement, naturally aspirated (without turbocharger and intercooler). 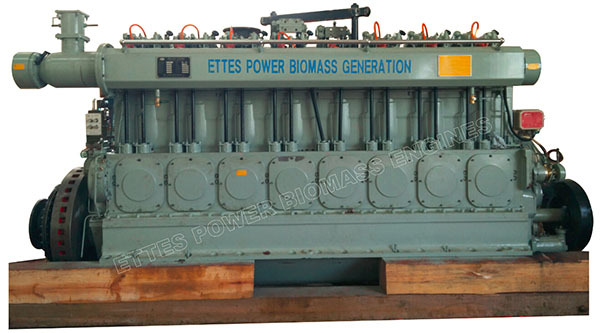 Ettes Power biomass engines is the very ideal engines for syngas power plant. 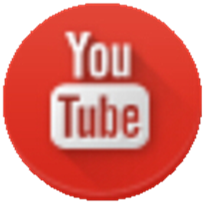 Please click here and go to YOUTUBE to see working videos of Ettes syngas-syngas engines. • Biomass from MSW, Woodchips, Sawdust, Straw, Rice husks, Nut-shells, and Chicken manure etc. • Industrial tail gas & refinery gas, such as coal gas, coking gas, semi-coke gas, coke oven gas, oilshell tail gas, carbide tail gas, ferrochromium tail gas, yellow phosphorus tail gas, producer gas and paralysis gas etc. Syngas is far different with methane base gas (natural gas, biogas and Coalmine gas etc). Syngas is much more tricky, it is low in heat value, high in tar content and unstable in gas quality (TAR always raise problems of pipeline-blocking, cylinder-pollution and spark plug-jamming etc). • Cylinders Structure in Line & Upright & Concise Layout, which means simple, easy and low cost in operation & maintenance. 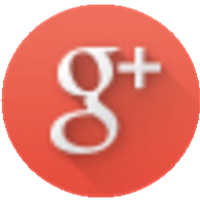 Engine-Overhaul can be handled at user’s site. • Large cylinder (300mm), long stroke, low speed and big displacement 215L and 242L, which means big reserve power capacity and constant power output. • Low engine speed at 500 or 600rpm, which means high reliability for continuous operation, sufficient combustion, low exhaust gas temperature and high heat efficiency. • Naturally aspirated (no turbocharger and Intercooler), which means low failure rate and minimum downtime (TAR in syngas always block and damage turbocharger and intercooler). • Internal mixing system (for syngas with high hydrogen content over 10%), gas and air intake separately, then mixed in combustion room, which means no risk of backfire and cylinder knocking. • Strong treatment and resistance ability against TAR, long term trouble free operation. TAR always raises problems of pipeline-blocking, cylinder-pollution and spark plug-jamming etc. • Compressed Air Starting System, smooth starting, high success rate and easy for maintenance. 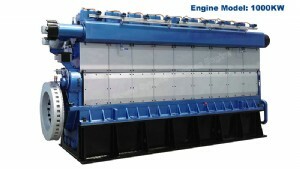 • Open Cooling System, adopting plate-type heat exchanger, high efficiency and easy for scale-removal. • Dismountable intake-valve-box, which means can clean TAR easily and conveniently (no need disassembling of cylinder head). • Low-speed engine makes the noise lower. The maximum noise ≤100dB. Through silencer, the noise will be ≤70dB. • Low speed means low components wearing, namely lower cost in spare parts replacement and long life span. • Long Overhaul Time of 60,000 hours and lifecycle of 20-25 years, which can ensure sustainable financial rewards of the power plant. 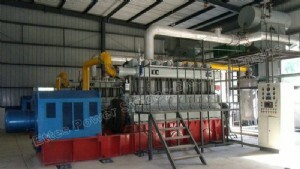 Before entering into engine, the biomass should be appropriate filtering, gas-liquid separation and pressure regulation. If the temperature is too high, it should be through cooling treatment, and make sure there is no liquid content in the gas. • Impurities particle size≤5μm, Impurity content≤30mg/Nm3. • The capacity of syngas pressure-buffering tank should match well with the generator’s gas consumption. Water Cooled, Four stroke, spark plug ignition, naturally aspiration. • Rated frequency: both 50Hz and 60Hz are available. 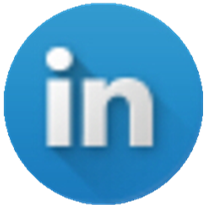 • Standard coupled alternators: Siemens IFC6 Series or Ganzhou. • Special demands for CHP/Trigeneration are available. • For syngas with high hydrogen content over 10%，adopting internal air/fuel mixing system. 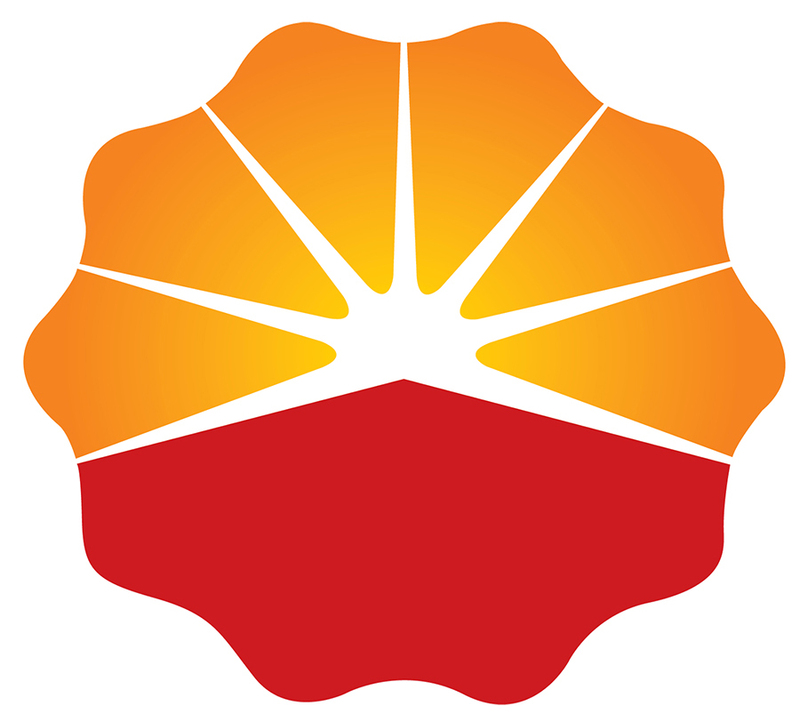 • Engine of 9300ZLD/M can apply for refinery gas with hydrogen volume content less than 10%. 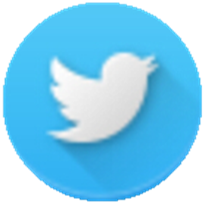 • The data herein can vary with individual requirements or improved technology. •The capacity of syngas pressure-buffering tank should match well with the generator’s gas consumption. 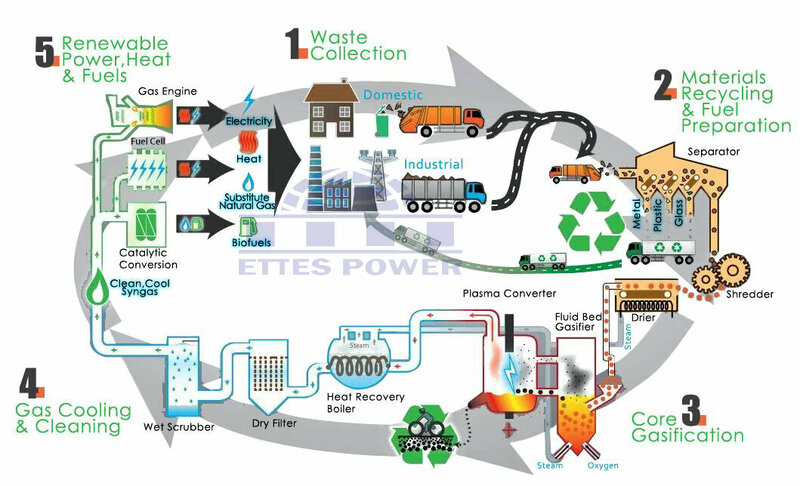 Waste-to-Eergy (WtE) or energy-from-waste (EfW) is the process of generating energy in the form of electricity and/or heat from the primary treatment of waste. WtE is a form of energy recovery. Most WtE processes produce electricity and/or heat directly through combustion, or produce a combustible fuel commodity, such as synthetic gas fuels. Municipal Solid Waste (MSW), including household waste, is the residual waste put into a black bin bag or wheelie bin. MSW contains a mixture of recyclable, organic, inorganic and biodegradable materials. Recyclable materials are recovered as many as possible before drying and shredding the remainder to make a Refuse Derived Fuel (RDF) for the process. The energy from waste process, transforms the RDF into a clean hydrogen-rich synthesis gas (syngas). Ettes Power 300 series engines can deal with this kind of hydrogen-rich syngas properly. Syngas-Biomass is organic matter derived from living or recently living organisms. In the context of biomass as a resource for making energy, it most often refers to plants or plant-based materials which are not used for food or feed, and are specifically called ligocellulosic biomass. As an energy source, biomass can either be used directly via combustion to produce heat, or indirectly after converting it to various forms of biofuel. Wood remains the largest biomass energy source today; examples include forest residues (such as dead trees, branches and tree stumps), wood chips. Besides wood, rice husk, crop stalk, straw, straw dust, coconut fabric dust and palm bunch still can be feed stock of biomass gas. Tar is always troublemaker for biomass combusted into electricity energy, which can block and damage the turbocharger and intercooler. 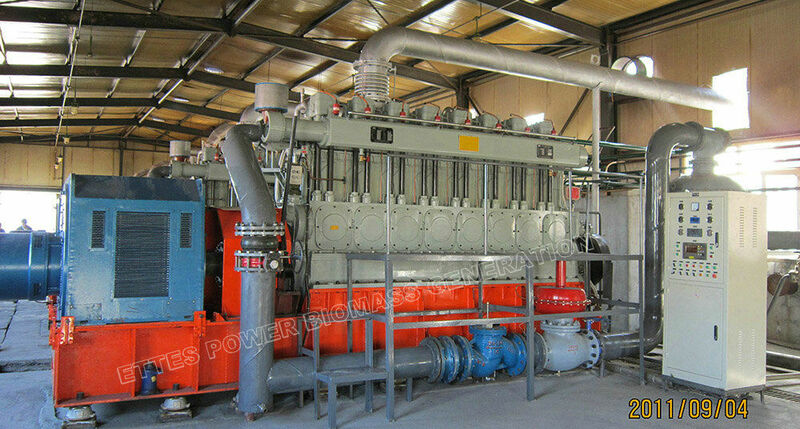 However, Ettes Power 300 series biomass engines has strong treatment and resistance ability against tar, and with advantages of low speed, big cylinder, big displacement and special design for syngas fuel, Ettes Power engines are the best choice for syngas/biomass power plant. Tags: producer gas geneerator, producer gas generation, producer gas engine, producer gas power plant, biomass engine, biomass power generation, biomass generator, biomss power plant, biomass gasification power plant, biomass gasifier plant, MSW Gasification power plant, waste to energy power plant, syngas engine generator,syngas gasification power plant, syngas generator set, syngas gasifier generator, syngas power generation, wood gas engine, wood gas generator, wood gas power plant, wood gas engine generator, wood gas gasification power plant, wood gas power generation,straw gas engine, straw gas generator, straw gas power plant, straw gas gasification power plant, straw gas gasifier generator, straw gas power generation. Materials: woodchips, sawdust, coconut shell, MSW, Straw, Rice Husk etc.